Juicing fresh fruits and vegetables has become very popular in recent years, so it's no real surprise that pomegranate juice therapy is being researched and hailed as possibly one of the best juices to fight various cancers and other diseases. Pomegranates naturally contain cancer-fighting antioxidants, vitamins, and minerals, so drinking it daily is a healthy preventive measure against disease of all kinds. What diseases or health conditions could this amazing juice prevent? Research is ongoing into the benefits of pomegranate juice therapy, but some of the early indicators show that drinking this juice regularly could help prevent stroke, diabetes, hypertension, high cholesterol, and cancer, to name a few. Several research projects are focusing on the possibility that pomegranate juice holds promise for fighting various cancers and the results so far have been mostly promising. Dr. Allan J. Pantuck was hired by the POM juice company to conduct research on a group of men at the University of California in Los Angeles to see if the juice would have any affect on rising PSA levels following the detection of prostate cancer. Due to drinking 8 ounces of the juice daily for a time, they discovered that the pomegranate juice did have positive impact on the PSA levels. More research will be conducted. Another study conducted in Korea on the affects of pomegranate juice on breast cancer indicates that further research is definitely worth the time and money to see what else they can discover. Yet another study, conducted by Hasan Mukhtar of the University of Wisconsin, shows that pomegranate juice extract slows down the growth of cancer in the lungs in mice. Why not drink pomegranate juice each day? It's true that the scientific research is still very new in regards to whether or not this juice can definitively cure or fight off cancers and other medical conditions. But, everything in this juice is so good for you! Enjoy some juice and know that it's helping your immune system get a great boost at the very least! You can create your very own juice therapy program by including not only pomegranate juice into your daily regimen, but by also mixing it together with other beneficial fruits and vegetables to get a daily dose of vitamins and minerals that will make you feel amazing and look terrific too. 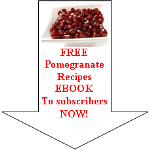 Read enough about pomegranate juice therapy and want to discover more about pomegranate juice?